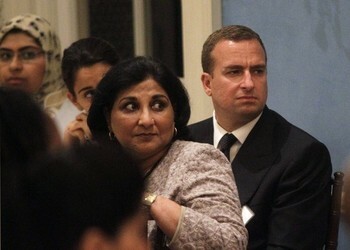 Bloomberg bends over for Islam at Iftar Dinner in Gracie Mansion (2010) | the "silent" majority no more! 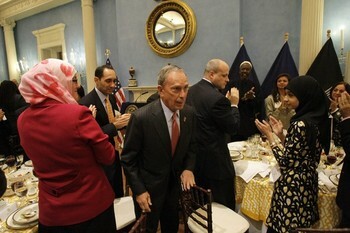 Mayor Bloomberg hosted his annual Iftar dinner at Gracie mansion this evening, August 24, 2010 at 8 PM. And his speech to those in attendance (and to the suckered press) continues to shows how little respect he has for the articulate and NON-RACIST protests of his constituents. No matter how they arguments are parsed, in Bloomberg-Town, if you don’t march to his drummer, you are UN-American. Period. Bloombergs opening remarks, ” We call this ‘The People’s House’ because it belongs to all 8.4 million New Yorkers who call this city home. People of every race and religion, every background and belief. We celebrate that diversity here in this house with gatherings like this. And for me, whether it’s marking St. Patrick’s Day or Harlem Week or any other occasion, these gatherings are always a powerful reminder of what makes our city so strong and our country so great. 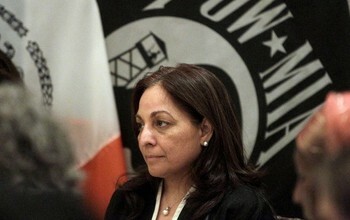 America is a nation of immigrants, and no place opens its doors more widely to the world than New York City. America is the land of opportunity, and no place offers its residents more opportunity to pursue their dreams than New York City. America is beacon of freedom, and no place defends those freedoms more fervently, or has been attacked for those freedoms more ferociously, than New York City.” His entire speech, if you can stomach it, is posted here>>. Otherwise, just jump to this next bon mot. and Sharif “He touches my heart” El-Gamal. OUT side the dinner, the press actually decided to do some interviews with the protestors. The impromptu protest was small because the information about the Iftar dinner was sent out with only about 90minutes notice, but the press did take the time to approach them with a few questions, even though they can’t bear to alter their pre-ordained observations. With Bloomberg so firmly in the pocket of the Saudis (for surely that will be exposed )we can expect more of this insanity from our Mayor until we VOTE HIM OUT OF OFFICE. This mosque is a symbol not to be endured ! Ever wonder how much side money Bloomberg is making off this deal….Bloombutt and our government need to realize that True American’s are not Bloomberg’s and we would not give up our freedom or turn over our country for any amount of money.